Virgin Galactic could resume test flights with a new spaceship within six months, the company said Friday, a week after the fatal crash of SpaceShipTwo in the Californian desert. 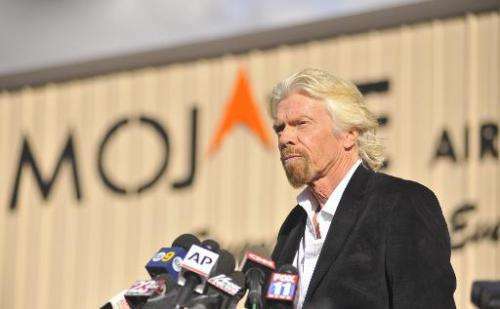 The United States' National Transportation Safety Board is investigating the accident, which has called into question Virgin chief Richard Branson's dream of tourist flights to the edge of space. "It's possible that test flights for the next spaceship could begin within six months, before the investigation is expected to conclude," a spokeswoman for the British tycoon's company told AFP. SpaceShipTwo co-pilot Michael Alsbury died in the crash, while the pilot Pete Siebold survived injured. The craft disintegrated shortly after being released from its mother ship WhiteKnightTwo, which flew it up to 45,000 feet (13.7 kilometres). "NTSB has let us know that we are free to continue operating during the investigation," the spokeswoman said. "We are being thoughtful about how we proceed—first we have to take care of our team and family who have without a doubt been affected by the accident and the loss of their colleague. "At the same time, comfort and purpose happen by immersing ourselves in the work that brought the brightest minds to Mojave and that is to build the world's first commercial spaceline. "We will be able to continue flying the mother ship while NTSB look into the cause of the crash," she added. The new test flights could take place in a second SpaceShipTwo, which is 65 percent complete, the company said Tuesday. Hundreds of VIPs, including Leonardo DiCaprio and Demi Moore, are said to have put down a $250,000 (200,000 euro) deposit on a space flight. Virgin Galactic said there was a "small percentage requesting refunds... due to personal circumstances". That was relevant news before the accident, but now it would be more newsworthy to note how many have cancelled and asked for their deposits back.